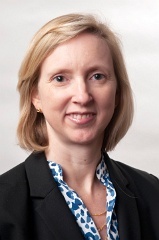 Abigail Davenport is a partner with Hart Research Associates. She has extensive experience conducting research for issue advocacy and nonprofit organizations, corporations, media, and trade associations. Since joining the firm in 1994, she has become highly experienced in both quantitative and qualitative research methods, including moderating focus group sessions for more than 15 years. Abigail focuses her efforts on helping clients answer difficult strategic questions, measure attitudes on complex issues, and leverage key audiences’ opinions to their benefit. Today, she primarily leads research projects for the firm’s nonprofit and private-sector clients, conducting qualitative and quantitative research to inform public education campaigns, campaigns aimed at changing social norms, corporate-reputation and brand-research projects, public policy efforts and public affairs messaging, and corporate social responsibility programs. Some of the many clients for whom Abigail has conducted research include the Family Online Safety Institute, The Woodrow Wilson International Center for Scholars Science and Technology Innovation Program, the Bill & Melinda Gates Foundation, the College Board, the Association of American Colleges and Universities, Futures Without Violence, The Coca-Cola Company, Exelon, AT&T, BNSF Railway, and Disney & ESPN Media Networks. Abigail is a graduate of Tufts University with a degree in international relations. Kate Fridley is Abigail Davenport’s research associate.